Great price, arrived on time! The cushion on car seat and stroller is very soft and cozy. Some reviews states the front wheels lock up while pushing sometimes, however, we have not encounter this problem so far, the wheels run fine for us. One thing we didnt like so much is the part where the seat clicks to the stroller is plastic, so all the weight of the baby is holding by plastic, we were worried it would not last as long as steel. So far it works great! Researching travel systems, I came across this one and LOVED it after doing some research Albee baby had the best price and super fast shipping. I highly recommend this product. I just received the travel system a few weeks ago for my little one and it is absolutely stunning. I haven�€™t had the chance to use it yet but, I cannot wait wait. It was very easy to assemble, the color is nice, and lightweight but safe. Worth the buy. Thanks Albee! I have had the adorra travel system for over a year now. As I fell in love with how beautiful it looked I am mislead by how it performs. 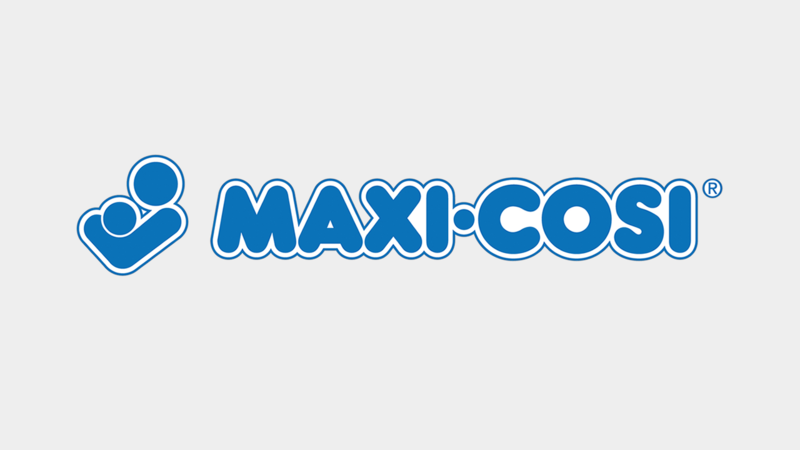 It is so disappointing how a trusted company as maxi-cosi would sell such a product that has so many issues. It took me a long time to write this review since I'm a busy mother and another one on the way. I have called and expressed my discouragement with my experience. 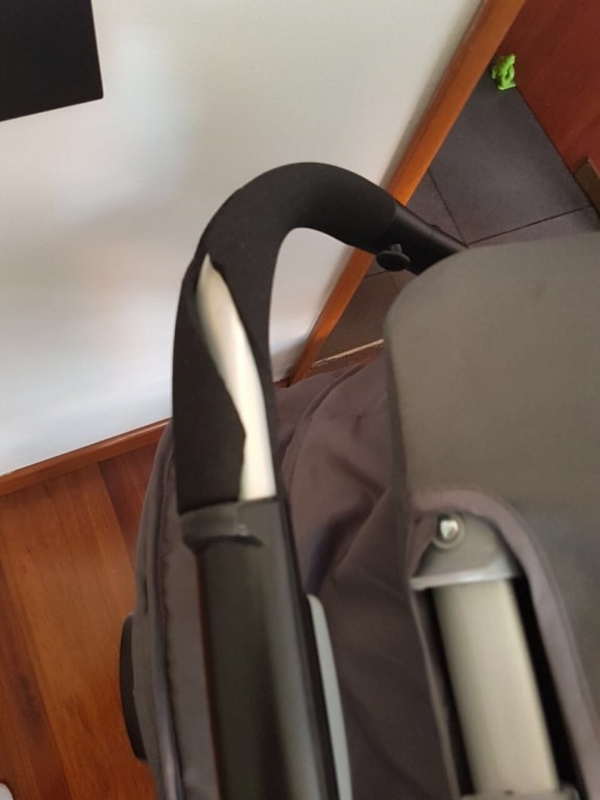 They have sent me a new adorra stroller, however I ran into the same issues just months later. After a couple of calls I was advised to destroy my current stroller. It would not make sense for me to do so since I would be out of a stroller when I shelled out $$ for this stroller. I was told that someone would get back to me and I never received a call. At this point I gave up and threw away this stroller. What a waste of money, time, and energy. The numerous issues I have had are on the adorra stroller itself and not so much the car seat. The front wheels randomly lock without the lock on, seatbelt straps easily lossens, the stroller lock location is at the center on the stroller (very poor design- you will lock the stroller by accident just by walking), the cup holder and storage pouch are useless (makes the stroller extra wide and difficult to get in and out of doors and aisles). As a first time mother I thought I did my diligence and research to find the best travel system on the market. Since I have had a flawed system I have a greater appreciation to my current stroller and an ease of mind. I was expecting a stroller strong and easy to manage with one hand, light to put in the trunk, but is the opposite, is heavy! The front wheels stuck all the time and is heavy to drive to! If you need use one hand like when you need open a door and push the stroller you will have a bad time trying it! I bought it in November and it already does noise like all plastics are falling out! I am really unhappy with this product! I wish I didn't have to give this even 1 star. The car seat base is pretty generic. Plenty of other manufacturers' offer much more sophisticated bases that are easier to install. 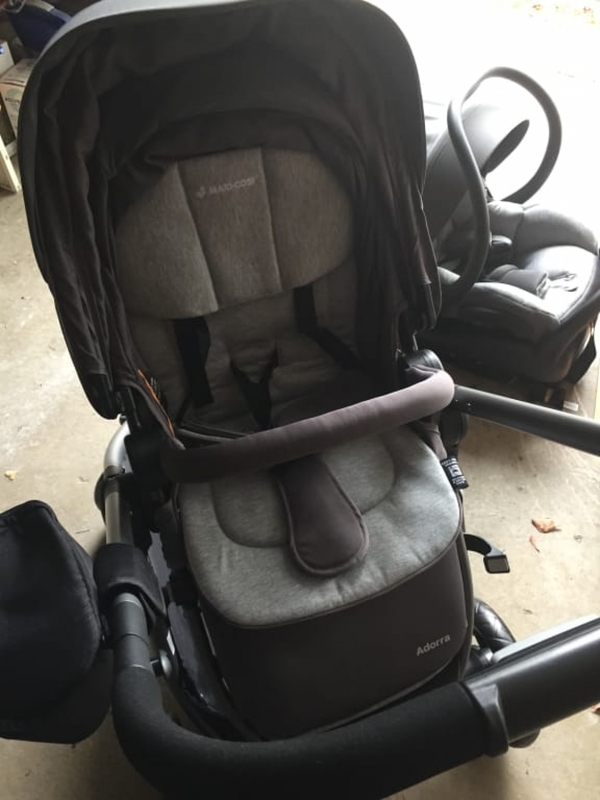 The car seat which connects to the stroller is wobbly even when it is properly clicked into position. It appears to be attached and sturdy but it's still completely unnerving. Furthermore, after a few months of light use the stroller is now utterly useless!! The front wheels lock up as if the brake was halfway on making it impossible to steer safely. The back wheels make a weird squeaky noise and do not spin properly. The stroller will glide normally and then randomly lock all of these issues make using it feel like torture. Seriously, do not let the esthetic appeal sway your decision to register or invest in this set!! The reviews about these defects are honest experiences and I wish I would have seen them. Save your money and invest in a better brand!! The front wheels are hard to maneuver. Constantly are blocked or take their own way. The foam from the handle bars came off om both sides (see the pictures) after six months of use only. The stroller is beautiful but it is horrible! The front wheels lock for no reasons its literally a workout to push the stroller around , the foam cover on the handle bar ruined the first month fwhich i had no choice but to rip off because it looked ugly , i struggled so much to fold and unfold the stroller base , total inconvience ! Never again! We bought this product as a gift to our daughter and what a nightmare. The front wheels locks up and it becomes impossible to navigate the stroller even becoming dangerous because it jerks the baby. For such a costly product, the quality is poor. This product needs to be taken off the market and be reviewed. Stay away from this product. We received this product as part of a gift from our baby registry. I told my wife that for the price we could get 2 separate travel systems of the same or better quality, but nooooooooo. This is a very attractive looking travel system, but it has tons of cons that overpower the few pros. I have search for reviews on this same model and ALL state the same issues. Front wheels are constantly locking making it almost impossible to steer and even dangerous. When using the carseat adapter, the entire carseat wobbles as you stroll. Carseat canopy seems to not lock on its open position, and have to keep opening it constantly. After all you are better off purchasing a more cost effective Item that will provide the same safety standard and avoid the headache. Smooth and Easy Travel System! I love this travel system! The stroller is smooth to push around and easy to turn. The drink holder and accessory bag is a nice touch for convenience. I love that there's plenty of room for storage at the base of the stroller for anything and everything you might need on your outing. The sunshade is great and folds over pretty far to block the sun and wind. The infant car seat is incredibly easy to install from the car to the stroller and when baby grows into the toddler seat, it gets even easier! The toddler seat folds right up with the stroller and is easy to stow away. �‚ A plus that I love that makes things more convenient - when you're ready to put the stroller away and you fold it up, it will stand on it's own on the ground folded while you get organized at the trunk of your car or in the garage or home, so you can put the rest of your things away! Just a little touch of convenience that I love! The colors offered for the Maxi Cosi travel system are adorable! Love it! Thank you, Maxi Cosi! Love this stroller and car seat combo! I am VERY disspointed as I had high hopes for this stroller. After only 3 months of use the front wheels constantly stick and it is SO frustrating. I dont think its possible to steer this stroller with one had, which is annoying for a busy mom. Also, it is HUGE, even when folded up. It takes up the whole trunk of my SUV. Considering the price point this is overall more trouble than its worth. A bit overwhelmed by all of the options and price points, my husband and I finally decided on the Adorra Travel System from Maxi Cosi. The Mico Max 30 was an easy pick, as it is the lightest car seat we could find. Growing baby + car seat = always getting heavier, so it was natural to pick the lightest on the market. Luckily, the lightest also was one of the softest, and most comfy carriers we had found in our search. Our little nugget agrees, and usually quiets right up for her ride in the Mico Max. Buying this as a combo with the Adorra stroller saved us a few dollars (vs. buying separately), guaranteed compatibility, and also a one stop shop for support on any questions that come up. The stroller itself is sturdy, and folds extremely easily. In its folded state, it can stand independently in our closet for storage. 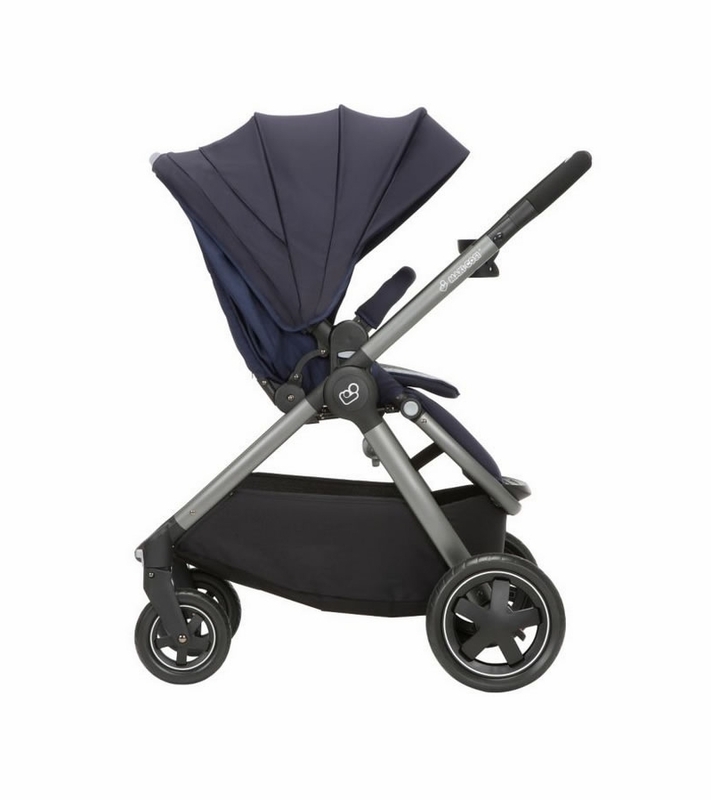 As far as pushing, it is a breeze, and offers a very nice and easy ride for the little one. Some reviews mentioned front wheel issues, but we have not had any issues what so ever. One thing to note, when we clipped the car seat into the stroller frame, we noticed that it rocked back and forth a little bit. After speaking with Maxi Cosi, we came to find this is normal when a car seat clips into the stroller with only two contact points. The other brands that we considered also had this same attribute - so it seems to be a common design. Once the baby is seated in the seat, this movement is minimal, and things are well secured. If you're still trying to decide amongst the many options, stop agonizing and go with this one! We are happy with our choice, and - as far as we can tell - so is our little one! I am a mother of 8 and am picky about what I buy. I like strollers that are easy to manage and be able to deal with other children, but this stroller is unmanageable most of the time even with 2 hands. The handle being adjustable I felt was very helpful since it makes it more comfortable to push when you are taller, however it is flimsy and gets stuck to where you can not move it up or down. The car seat handle is very weak, and is positioned weird to make it awkward to carry on the side of you. The stroller gets stuck and will not open all the way, which is frustrating having to fight with it when you are trying to baby in it. We have a Denali and this stroller is so big that it takes up most of the back area. I originally liked the stroller combo since it laid down really far, for newborns that is a plus because of them not having the neck strength. I do not like seeing babies with their head leaning forward or to the side while sleeping. I loved the bigger basket along with the fact of being able to put things in from the front, since when the stroller is laid all the way back it is difficult to put things in basket when opening is in the back of most strollers. We paid over $500.00 for this system and I am extremely disappointed and wished that I had bought something else. I'm a first time mom has this travel system with hopes to use it again after my second child grew out of it. I like the stroller part more than I like the car seat, however, I won't be using it for baby number 2. What I love about the travel system is that you can flip the seat facing you or away from you. You can have baby sitting up or laying down which is very nice as well. What I do not like about it is that it's not very simple to fold up and load into your car. When it is folded it's very large and takes up a lot of space. It's not easy to switch seats between car seat and seating options without the car seat. If you go back and forth between those two options you have to bring all the attachments with you every time. I wish that it was simpler to switch back and forth. As for the car seat, I hate it. The infant head insert has absolutely no support for a new born. I had to buy additional support for his head and found other car seats with much more support. I thought that the fabric was going to be really nice, soft and easy to wash but it's not (except for the washing part which is pretty easy). After 2 months the fabric started to ball up where my son's feet were and the canopy fabric started to stretch and now just hangs from the back. All in all I just like the design and the look. The car seat would have been must better if he held up nicely and made with good fabric. I had so much hope for this! I love this stroller so much and all the versatility it offers! It looks great, feels great, but the front wheels are terrible! They will randomly lock (as noted by another review) and I literally have to make a 3-point turn just to get through the doorway. I want to keep the car seat, the base, the additional stroller attachment, even the cup holder, but PLEASE do something about the stroller wheels. Thank you so much! The stroller looks great. I fell in love with it as soon as I saw it. The fact that it's padded and folds inone is awesome. But I bought this stroller brand new and I only had it for a few months and the front tire gets sticks while I'm walking, so when I'm walking the stroller stops or starts to go sideways because the front tires is stuck. The back tire also makes this loud kind of scratching noise so when we are somewhere when we need to be quiet the stroller is loud that I have to pick the back up so the tires aren't really touching the ground. I was very happy about it at first but right now I'm not happy with the fact that the tires are making noise and getting stuck. I take good care of this stroller. I participated in a market research study and received a product to evaluate the Maxi-Cosi Adorra Travel System. The latch system was easy to use. To connect the car seat to the base, you just pushed it to the base instead of having to hook it like some other travel systems. The car seat appeared very comfortable and padded with quality material. There was even an infant insert for extra comfort and support. The seat carry handle was nice because it was ergonomic and fit nicely in my hand. The instructions were clear, and it was easy to assemble. The base felt secure; however, it extended pretty far forward. With the handle downwards, the car seat took up quite a bit of room in our sedan. The front seat needed to be pushed far forward. That being said, it fit nicely in our SUV. The stroller was easy to put together. I liked the adjustable height of the handle. The single wheel lock was convenient. Folding it down was a little difficult to do though, and it could take a little practice. 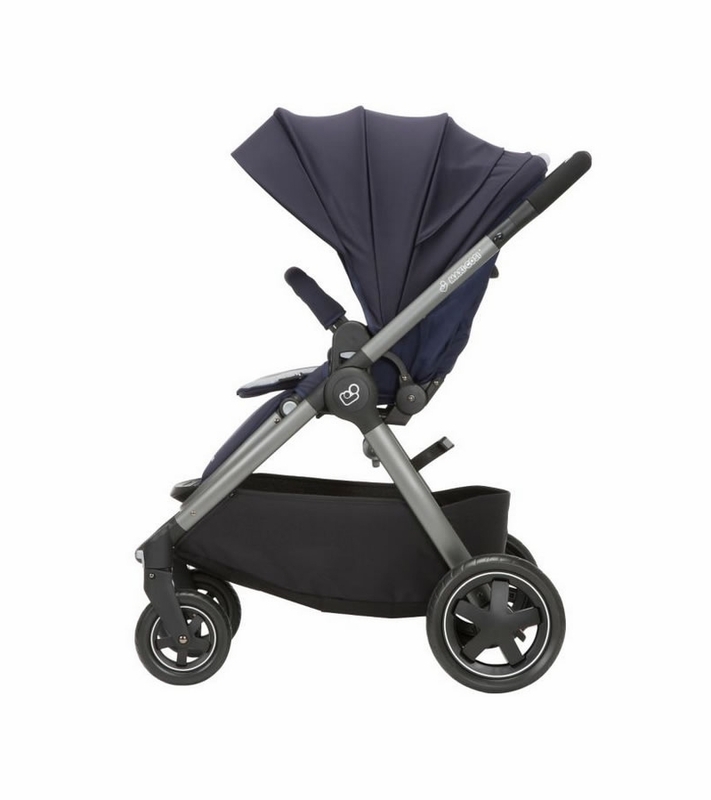 One of my favorite parts about the stroller and car seat is that they look nice and expensive compared to some others that I`ve seen. I also liked how comfortable and safe my daughter looked with all the padding around her. I received this travel system for free in exchange for this review. The travel system is easy to use and the stroller was light weight and easy to maneuver. Also, easy to get in and out of the car. The color was gender neutral. My baby was comfortable in the seat and stroller system. I love the fact that we could snap the seat into the stroller and not disturb him. Everything appeared seamless. The top was easy to steer and push for my husband and I, the height worked for both of us! 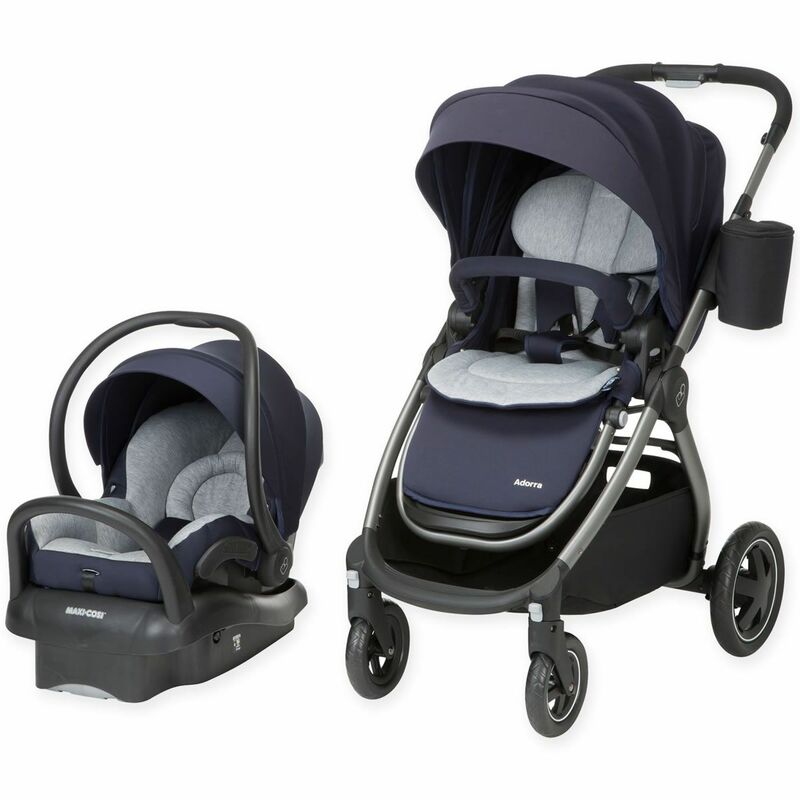 The Maxi-Cosi Adorra Travel System comes with a car seat, stroller and a variety of attachments. Pros- The first thing I like is the super soft cushion padding- my previous seats did not come close to the softness of the fabric or the cushy padding. The second thing I like about this seat is that is it so very light to carry. I found it very easy to remove from the car seat base as well. The visor provides great coverage. Cons- This seat is large so if you are looking for something space-saving it may not be your best option. The bar at the end of the base may impact the fit in a smaller vehicle. We installed this in the bucket seat of our mini-van and it fit fine. Pros- This stroller has soft cushion padding and it is very easy to switch between the large seat and infant car seat. The ability to adjust the backrest to a recline position and the handlebar height is simple. The storage basket under the seat is much larger than my previous strollers- great for storing those extra blankets, water bottles, etc. The added bonus is the stylish look of this stroller! Cons- The buckle and collapsing of this stroller are a bit tricky. It look me playing with it a few times before I had it down. My biggest concern with this stroller is that both the infant car seat and larger seat seem to wobble a bit. I don`t feel it is unsafe or will tip but it does rock front to back a bit. Overall I would recommend this product to anyone looking for a travel system. I received this product for free to use for this review. I received this travel system as a free sample to review. Really nice travel system! I definitely prefer the stroller over other travel system strollers I have used in the past. The car seat feels very nice and is padded well. My daughter looks very comfortable in it. I started using the car seat when my daughter was about 10 months. At 20 lbs. and 28 inches. Her feet dangle some at this point but I think I would have really liked this car seat more when she was a newborn again the padding looks and feels nicer. She seems more supported and comfortable. The handle is a little awkward and feels a little thin not as comfortable holding as I imagined. The base was a little difficult to install, but I drive a compact car and I was able to fit the base in my car. I have tried other travel systems where the base was too large to fit comfortably in my car. The Stroller material is nice as well. The padding is easy to remove to wash. I love the fact that it is so compact. I have a compact car so it is nice to be able to separate the seat from the wheels and fold it into 2 parts. The under bin storage is large and spacious. My favorite features are the adjustable handle bar and foot brake. 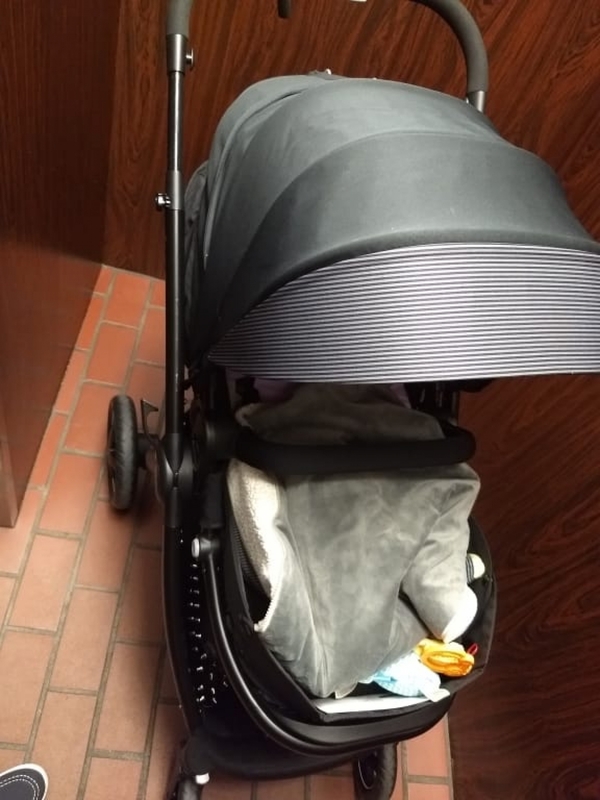 I am from a tall family, I am 5'10 but I have family over 6ft so it is very convenient to adjust the stroller height to what is comfortable at the moment. I also love that the travel system allows for the car seat to be its own attachment(a lot of travel systems have the car seat sit over the stroller seat), however I am not fond of the fact that it needs a different attachment piece that has to be carried separately. Another attachment that is helpful but awkward is the cup holder. I find that it sticks out awkwardly, but when you have a bottle for baby or you it is nice. There is also a cooler pouch that is nice as well, but I did not use it. It is a little difficult to close the stroller, but you adjust overtime. Overall, I really enjoy the stroller. it was easy to put together, feels sturdy, easy and strong wheel locks, the material is nice and easy to clean. I love that the seat is super adjustable to suit what is most comfortable for your child at the time. It's a great value! I love this stroller! Sometimes higher cost doesn`t mean higher quality, but in this case it definitely does. It is so soft and comforting for my child. It is easy for me to maneuver and use on my own too. The car seat is easy to get in/out of the car and lock into the stroller. I also love the way the stroller can be used multiple ways as my child grows. It also makes me feel like my child is safe in both the car and stroller whenever we are using it. I should mention that I was sent a free sample to use for this review. Comfortable stroller for a tall parent! I received a free sample of this stroller/carseat to use and write a review. This was very easy to assemble. I love the height of the stroller, as I am a tall person. It is very comfortable with the adjustable handle. It is a very sturdy stroller and carseat. The material is a little different from any strollers/carseats I have had in the past. It is more of a jersey-type material, rather than polyester or nylon. I`m not sure at this point (with it being new) if it will eventually get `pills` on it or not, but right now it is great! The stroller is easy to fold. One thing I did not care for with this stroller/carseat, you cannot put the carseat onto the stroller very easily. You have to take off the stroller `seat` completely in order to attach the carseat. I was used to opening my stroller, and setting the carseat onto it until it clicked on. With this stroller, you cannot do that. If you are using the carseat for your baby, I would suggest removing the stroller seat at home and leaving it stored there. When your baby is bigger and will sit in the stroller without the carseat, then put the stroller seat back on the stroller and leave the carseat stored at home! Or you can leave the carseat in the car and take baby out of it, put baby in the stroller, and not be changing the seats around. Kind of a pain!! Overall, I love the stroller! The only issue I have with the carseat, I drive a minivan, and this carseat base is kind of big. I had a hard time getting it onto the middle row captain`s seat of my van. It stuck out so that the front passenger seat had to be moved forward to allow room for this carseat and base. The carseat/base did it`s job for the baby, but moving the passenger seat forward wasn`t a comfortable fix for that person! Overall, the stroller and carseat are nice and sturdy, but they do take up some room in the van. I would recommend this stroller/carseat, but you have to be able to `adjust` to the two different seating arrangements on this stroller. It is a nice stroller combo! I recently participated in a market research study and received this product to evaluate. The Adorra Travel System, by Maxi Cosi was shipped to me in a neatly, well packaged sturdy box. When I opened the package, the components to the stroller and the car seat were wrapped perfectly and there was extra padding to protect the product. This was not your usual suspect with hundreds of pieces to sort through and figure out. I pulled the owners manual and instructions out and began assembly. I would like to first state that I am the WORST person to put things together. I was surprised by the easy assembly directions and how clear the instructions were, complete with pictures. I was able to fully put this travel system completely together without struggle nor frustration. The hard part was done, if you can even call it hard. As I was assembling the stroller, I noticed the incredibly soft, breathable cotton that the seats were made of. The stitching was neat, tight and there were no visually unappealing aspects of the stroller. I would have to say the materials used in this product are by far my favorite feature, and exceeds competitors products by a long shot. I placed my baby in the stroller and buckled her in. I tend to have a baby that gets hot and sweaty easily, so the soft cotton that the stroller is constructed of is a huge plus for us. She enjoyed her seat, it supported her well and there is even room to grow with an area that extends for their feet to lay straight out. Compared to another name brand stroller I have, I can appreciate the quality craftsmanship that was put in to this particular brand. There is a super nifty weather proof bag that hooks on to the side of the stroller for your cell phone and keys, which is great when you want them easily accessible to you. On the other side of the stroller, hangs a cup holder as well. This always comes in handy when we go to the mall, festivals or just for a walk around the neighborhood. Another benefit to this stroller is that it folds up nicely in the back of the car and is not bulky or hard to take down. There is one handle that folds the entire stroller down which then you can easily stow away in your trunk. The infant car seat that comes with this package is nothing short of spectacular as well. The installation is easy and the seat provides ultimate comfort for the little one. Again, when she sleeps she tends to overheat and get sweaty, however I have noticed with the soft cotton seat that is extremely breathable, she is not sweating and enjoying her car rides. Overall, I highly recommend this travel system. This product exceeded my expectations and has by far left it`s competition far behind in the dust. High, quality craftsmanship is the best way to describe this product. I participated in a market research study and received the Maxi-Cosi adorra travel system to review. I installed the car seat base using the LATCH connection, however it can be used without the base as well, using the standard seat belt. My daughter seemed very comfortable in the car seat, it is sturdy but very lightweight, much more padded than the other brand we had. I ended up removing the strap covers as my daughter kept playing with them and using them as a teething toy. You can order additional seat bases but they are considerably more expensive than other similar brands. Now I absolutely LOVE the stroller. The assembly instructions were very clear, it took us 10 minutes to unpack and put it together. My favorite feature about this stroller is all the recline options, the baby can sit upright, feet up, half reclined, or fully reclined. The fully reclined option comes in very handy if you're not home at naptime. Seat is nice and comfortably padded and can face either way. Much like the car seat, I removed the strap covers, they didn't really affect the functionality, and my daughter just kept trying to chew on them. The shade is nice and thick and offers good sun protection. The stroller offers a smooth comfortable ride, and is very easy to navigate. The break is very reliable, we tested it on an incline and the stroller didn't budge. You can also lock front wheels separately - definitely a bonus. The storage basket underneath is a generous size and comes in handy. You can also use just the car seat and the stroller base. My only complaint would be the space it takes up when folded. I have a mid-size sedan and if I put the stroller in the trunk I hardly have space for anything else, maybe a diaper bag. I received the Maxi-Cosi Adorra Travel System as a free sample to use for my daughter. I was able to take it through an airport experience. We only had the car seat and the stroller base. We arrived in New York and I was able to use the base to hold many of my items. We manuvered in and out of all kinds of people on this travel. I also had people ask me about the stroller.The base is light weight, but mighty! The car seat is ergonomically balanced around female curves to help when carrying the base. Which all moms and dads know it gets heavy. The actual seat for the stroller is great in many ways. The several position options are awesome. I really love how she can face me and have the awning oversized keeps out the blazing sun. The buckle is a little challenging when she is a squirmy-wormy, but looks comfortable once shes all buckled. 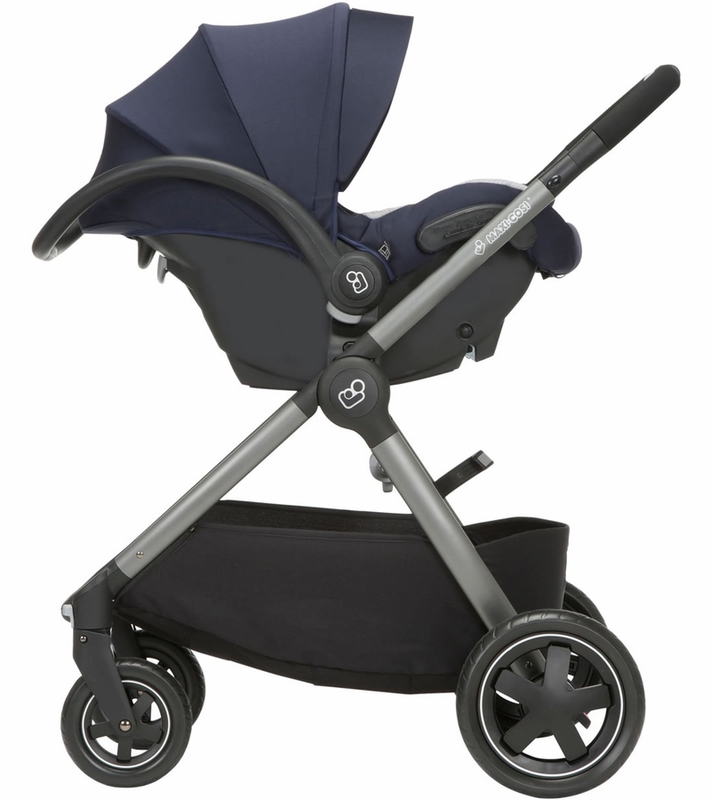 Overall, I recommend this product to parents` that like light weight and a well designed travel system. I received a free stroller and car seat to review. Overall, I was very pleased with the product. For starters, the stroller had a ton of storage compared to other brands and styles that I`ve used. The car seat easily latched onto the stroller. The handles of the stroller were adjustable for height. My husband loved that feature. I was more focused on the storage. I could fit the whole diaper bag underneath! As for the car seat, the ease of installation was comparable to other brands we`ve used. It was also light weight and easy to carry. I was very pleased with this product. The quality and ease of use was superior to any other brand that I`ve used. I would definitely recommend this product to a friend. This system - car seat and stroller are a DREAM TEAM! I participated in a market research study and received the Maxi-Cosi travel system to evaluate - which was a HOME RUN! What a product! I LOVE IT! This travel system is amazing! It exceeded my every expectation. 5 Stars for sure and A PLUS PLUS! My infant was in absolute heaven with this comfortable and cozy seat. The last three times I brought my newborn babies home from the hospital, I kept turning around in my seat begging my husband to hurry home for my little baby was not secure and comfortable (head leaning and too little for the straps) in the other brand seat we had. 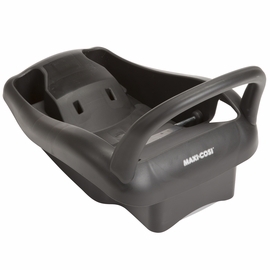 With the Maxi-Cosi, I didn't have to worry, my baby was secure and held nicely in the Maxi-Cosi seat. It was perfect for my newborn! I also have an 18 month old little girl which the stroller works perfectly for. I can lay the seat back and change her clothes or diaper anywhere... and let me tell you, with four kids and on the go every weekend - Disney, Zoos, Museums, Aquariums..etc. this was a perfect fit for us. The storage compartment on the bottom is HUGE! It's great for my diaper bag, purse, 3 kid cups and snack cooler... nothing falls out and everything fits nicely. This system folded up nicely, quickly and tightly. I could lift it easily (surprising, very light and extremely durable) and store it in the back compartment of our Honda mini-van. I love being able to adjust the straps easily and taking it apart to wash the seat was effortless... I always had my husband take apart the other brand because I could never figure it out. BUT with the Maxi-Cosi, I simply unhook and drop it in the wash machine. 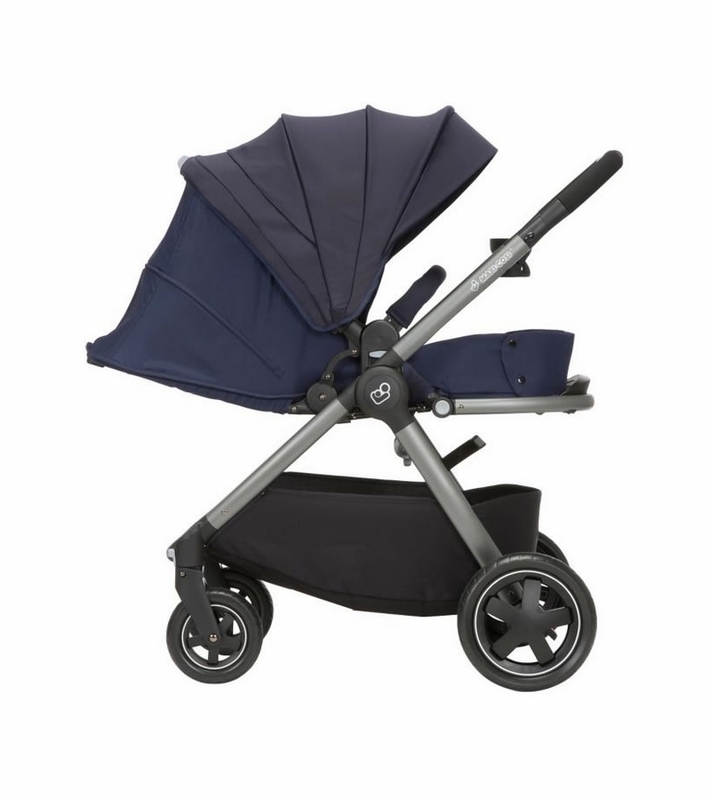 I have the Navy color and it is simply stunning (yes, I'm a "soccer mom" and very excited about this stroller - it makes my day - everyday!). The sun shades are made with a solid durable fabric. I HIGHLY RECOMMEND IT!! This system - car seat and stroller are a DREAM TEAM! 2nd baby after 11 years and this seat seat, stroller is great. The Cadillac of stroller systems is what my husband calls it. Not sure if there has just been so much progress in the making of these systems in the past 11 years but this is great, everything you need as the mother of a newborn and I'm sure it will be great as the baby grows. Love it and would recommend to everyone that asks. When I had my second child I thought we would reuse the infant seat that we already had. Unfortunately, we had major fit issues for some reason. After weeks of trying to get the straps to stay on, I gave up and we got the maxi-cosi adorra travel system. I have a maxi-cosi for my 4 yo and love that its so comfy, so I was so happy to see how comfortable this infant sit is too. The padding is perfect (except for the shoulder pads that are too big for my 2 month old). The seat looks like she's sitting on a cloud. The seat is also pretty light compared to other seats and the stroller is awesome! I love that the seat goes all the way down eliminating the need for an extra bassinet attachment for infants. It has great storage and isn't crazy big. It's a nice size. My only issue with the stroller is the adapters for the car seat. I hate that they are so big and need to come on and off depending on your seat. That being said, its a tiny dislike compared to the rest. This car seat stroller combo is really work considering. 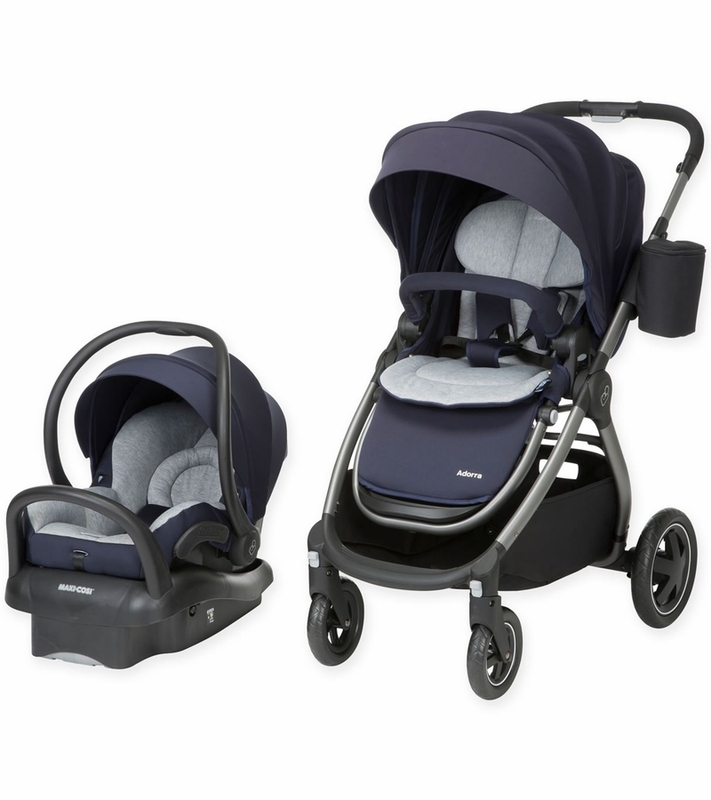 From Maxi Cosi: The Adorra stroller will indeed come with a set of car seat adapters in the box/with purchase. These adapters will allow you to attach any US Maxi-Cosi Mico car seat (includes Mico, Mico NXT, Mico AP, Mico 30, and Mico Max 30) to the stroller frame directly.